Hi everyone! Long time lurker, first time poster. I love this forum, it is so inspirational, I share ya'lls completed projects with my husband, who got a kick out of the Star Wars and Lord Of The Rings Amigurumi dolls! I even have my Mom addicted to these forums as well, there are soo many talented folks here! Here is my first attempt at anything like this, my mushroom house! I made it out of 100% recycled cashmere yarn, no reason really, it is just the only yarn I have been collecting for the past several years so I just have a large variety of colors available. 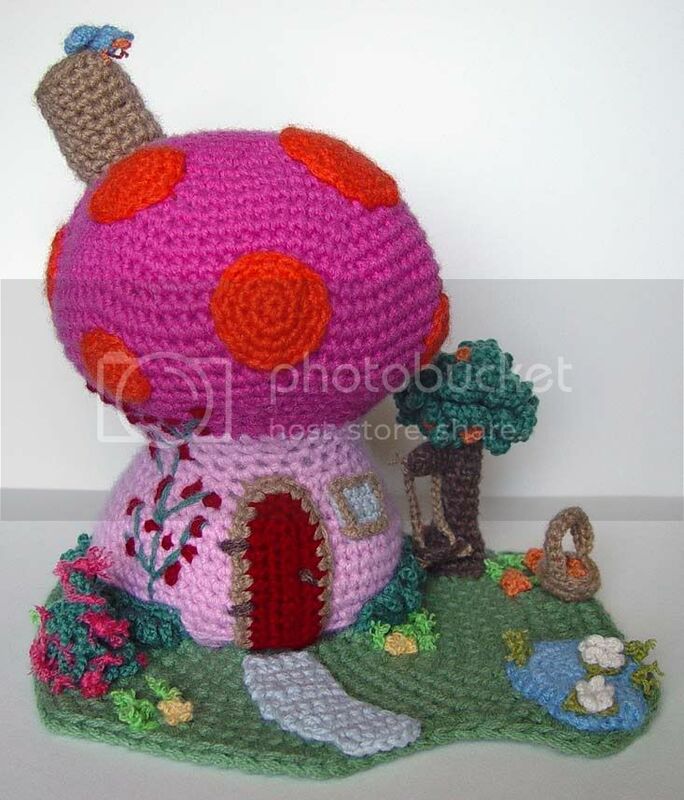 Re: Here is my little crocheted mushroom house: WARNING PIC HEAVY! That is the most amazing crocheted thing I've seen in a long time! Great job, and welcome! Hi! And thank you so much for the compliments! Part of it is stuffed, the house and the trunk of the tree. I love to crochet, my mom tried to show me when I was young how to do it, but I never could get past the chaining part! Then when I was about 25 years old, (9 years ago), she sat me down and showed me how again and it finally clicked! And I have been a crocheting fool ever since! Your house is fantastic! I love the details on the lawn and the roses climbing up the side of the house. Mother of 3 small children, and if you think my hands are full, you should see my heart! Wow! You're a total yarn artist! My next one that I have already started is going to be a lake front with a dock and a boat, a patio, hammock, etc. and the colors of the house are going to be blues and greens. Holy crap this is awesome! I never could have imagined something like this could be crocheted!